In the first decade of the twenty-first century a new wave of thinking has emerged from tech billionaires that may shape the way private capital gets invested to tackle social problems. These entrepreneurs broke the business mold in the 1980s and 1990s and are now trying to break the traditional pattern of philanthropy pioneered by Andrew Carnegie and John D. Rockefeller, Sr. some one hundred years ago. 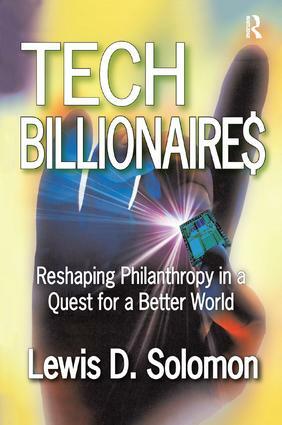 Combining billions of dollars of their personal capital with new ideas, cutting-edge businesslike techniques, media and marketing savvy, the tech benefactors profiled in this book are attacking some of the globe's most intractable societal problems. In trying to make a difference in the world, these new philanthropists, dubbed "philanthrocapitalists" by rhe author seek to break down traditional barriers dividing business, charity, and government. As a result of the rapid wealth creation in recent years, the world now boasts 1,125 billionaires, many of whom are self-made, according to the Forbes' 2008 list, including Bill Gates, Pierre Omidyar, Jeffrey Skoll, Stepehn Case, Sergey Brin, Larry Page, and more. Their massive wealth has created new philanthropic challenges. Imaginative giving by the new billionaires is beginning to transform philanthropy in terms of timing, involvement, strategy, and tactics. How this development impacts society as a whole is the subject of Lewis Solomon's book. As the author notes, the traditional categories of business and philanthropy may no longer serve to meet the challenge of social problems. In the twenty-first century the tools and resources used to solve societal problems will be far more varied and mixed than previously. We now see interesting partnerships and new ways of thinking. The divide between profit and social good will narrow. If successful in using their money in innovative ways, government or for-profit business could scale up the catalytic efforts of the new philanthropists. This volume is a proactive, innovative guide to a new era, not just a new technique of monetary support. Private Foundations in the United States: The Impact of Andrew Carnegie and John D. Rockefeller Sr.